So, am I happy now that I reached the lowest number? Well not really. The goal is not to lose weight, but to lose body fat. That's two different things. If I'm not mistaken, I have about 8 kilos of fat I need to get rid of. 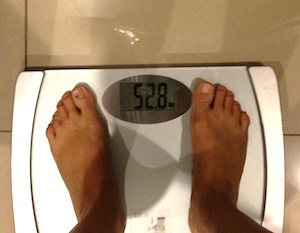 If that means I have to lose 8 kilos from my current weight, I will weight about 45kg! Scary, right? And even if I lose the 8 kilos, there's no guarantee that it's all fat that I lose, it could be muscle too (even scarier! ), unless I eat and exercise according to my goal. The goal is to lose fat and GAIN muscle, which means my weight will probably stay the same or maybe even heavier. Which is fine because muscle is denser than fat so even if the weight is the same, the size would be different. Now I don't care at all what the scale tells me. Like the coach said, don't focus on the number of your body going down but focus on the number of weights your dumbbells and barbell going up. Lifting does burn the fat and bulk up muscles... do the reps nice and slow, good forms help a lot! Have fun with weights!